No. 4 overall pick Dion Waiters drives against fellow rookie, and No. 3 overall pick, Bradley Beal in the players’ first career NBA game. Waiters’ Cavs won, 94-84. Dion Waiters, a puzzling pick at #4 overall in June’s Draft, showed everything he had to offer last night, scoring 17 points on 6-of-14 shooting from the field, including 2-of-5 from three-point land. Waiters also contributed on the defensive end with 3 steals to lead the team. Waiters, who’s preseason play showed some inconsistencies, seemed as if everything truly clicked for him last night, and it couldn’t have come at a better time for him. Waiters and Cleveland play next on Friday night against the Chicago Bulls. Unfortunately, this “award” goes to several rookies who simply got caught up in the spirit of competition last night. Rookies such as Kris Joseph of the Celtics, Robert Sacre of the Lakers, and Jared Cunningham and Bernard James of the Mavs didn’t see the floor at all last night, while others such as Fab Melo (Celtics) and Darius Johnson-Odom (Lakers) weren’t even active for last nights game. These rookies will get their reps throughout the season; yet nothing can be held against them, or their coaches, for pushing aside player development to get that ever-important first win of the season. Also, Tyler Zeller and Jared Sullinger played limited minutes last night, as their talents fell by the wayside whilst their teams closed out a close win and played catch-up all night (respectively). Although his team suffered a loss, Bradley Beal played well in his time on the court. Earning the start, Beal shot 2-of-8 from the field and 2-of-4 from three, and tallied 3 rebounds and 3 assists. With a depleted offense due to the absence of John Wall at point guard, Beal will have to provide more offense for the team; however, the rest of the team did not meet expectations last night, shooting a poor 35% from the field. Beal next plays on Saturday against the Celtics. The Mavs secured an impressive win against the always talented Los Angeles Lakers on the road last night thanks to an impressive performance from Jae Crowder off the bench. Crowder, who was in and out of the starting lineup throughout the preseason due to injuries, willingly accepted a bench role for the season opener and played well, scoring 8 points on 3-of-7 shooting (2-of-4 3PT) and tallying 3 rebounds, 2 assists, and 1 steal. Crowder’s role this season looks to have him as a bit of an Energizer Bunny role: he comes off the bench to provide solid play and once he starts, he just keeps going and going and going. 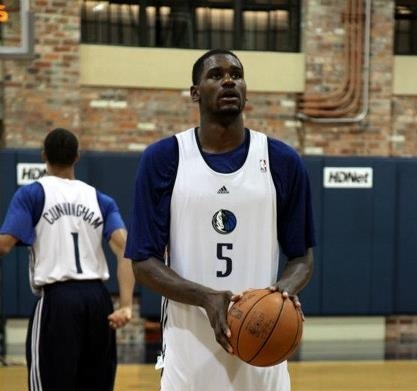 Crowder’s motor should continue to get him minutes and those minutes will lead to results. Crowder’s next game will be tonight as the Mavs travel to Salt Lake to take on the Utah Jazz. It appears as though Bernard James may get a chance to make an impact with his new team sooner than anticipated. James, a center and the 33rd overall pick out of Florida State, was drafted by the Dallas Mavericks to help clog up the middle of the lane. James was drafted primarily for his defensive presence, as the Seminoles have produced defensive stalwarts in the past. The Mavs would seemingly work James into the rotation and give him garbage minutes throughout the season, especially with the acquisition of new center Chris Kaman this summer.Yet, in only the first day of training camp for the new season, Kaman left practice early with a lower back strain. Kaman hasn’t been able to shake the injury bug over the past few years, as he’s battled foot and ankle issues, among other things. With Kaman now out, James may very well find himself practicing more with the starting five than he initially expected. While the Mavericks also have newly acquired PF Elton Brand on the roster, it doesn’t seem likely that Dallas will work with a smaller lineup if they can help it. Both Brand and Mavs superstar Dirk Nowitzki are good (if not great) power forwards, but both require a high amount of touches to be truly successful. Also, neither is a true defensive guru, which could result in a large amount of high scoring affairs. With all that in mind, it looks as if James has the chance to make the most of this opportunity. He has the size, stature, and defensive game that allowed Tyson Chandler to find a home in Dallas just a few short years ago. Here’s to this golden opportunity for James, and to see whether or not he will answer the call.